Neil Young’s recent roll-out of his “Archive Series” has been a treasure trove of recordings from the man’s vault, featuring live and studio recordings that have either never seen the light of day at all or have never been released with such painstaking quality in mind. So far, fans have gotten the legendary performance from Massey Hall in 1971, a smoking set by Young and Crazy Horse from the Fillmore in 1970, some early recordings from 1968 and a mammoth boxed set spanning 1963-1972. But no release in the series thus far matches the quality and exuberance of the latest release in the project, the live acoustic, Dreamin’ Man Live 1992. 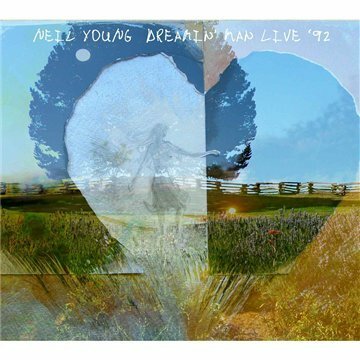 Recorded on tour in 1992, Dreamin’ Man captures Neil Young when he’s perhaps at his finest: alone. The album’s ten tracks (which mirror his 1992 studio release, Harvest Moon, in content but not running order) solely feature Young on each performance, using a guitar, harmonica or piano to accompany his stark-yet-alluring vocals. Gone are the lush, low-key colorations found on the album versions of the same songs, replaced by an intimate air that make already perfect songs that much more so. At the very least, it’s proof that Neil Young doesn’t need bells and whistles to make his music sound good – it can stand on its own just fine. Dreamin’ Man opens with its title track, a beautiful tune that is given a new luster in this minimalist approach. The song gives way to “Such a Woman,” reduced to Young and his piano relating a simple message of love. Next up is “One of These Days,” a track that was amazing in its studio form and comes off quite well in this setting as Young recalls his past with gentle strums and heartfelt lyrics. It’s a poignant moment that stands out amongst the many others that surround it throughout the album’s hour. Dreamin’ Man earns its accolades beginning with the next song, the absolutely magical “Harvest Moon.” The original version of this song is one that feels as though it was recorded beneath the very feature it is titled after, with a light acoustic guitar accompanied by brushed percussion, a stand-up bass and lilting backing vocals. Here as before, it is just Young and his guitar/harmonica combo and the listener is still treated to a song that sounds as though it was recorded sitting in front of a barn as opposed to a theater full of people. The subtle harmonics that once blended into the background are now brought forward, giving Young’s admittedly off-kilter vocal style that much more of a chance to shine through the mix. “Harvest Moon” is quickly followed by “You and Me,” a move that reverses their order from the original studio album. Here, the songs belong together, as the stripped down version of “Harvest Moon” merges quite will with the already bare bones “You and Me,” another simple yet thoroughly moving song of love. They are a pair of songs that you never want to end, but luckily when they do Young has more than enough to stave off disappointment. Dreamin’ Man is rounded out by “War of Man,” a haunting tale of the ongoing battle between man and the natural environment. On paper, that sounds as though it would be somewhat of a soapbox step-up for Young, but he manages to convey his point without getting too preachy. Instead, it’s a powerful closing to a truly beautiful collection of recordings from one of the most endeared periods in Young’s vast career. If the remainder of the “Archive Series” includes releases as undeniably strong as this, listeners will be in for one hell of a treat. To purchase a copy of Dreamin’ Man Live 1992, please click here.